The team was very responsive to my many email questions. This was my first AirBnB experience and they made it effortless. 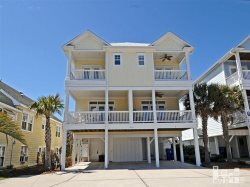 Beautiful location right on the beach in Carolina Beach and walking distance to a few restaurants and the boardwalk. Good communication with A1 was appreciated. Nicely furnished and a beautiful location. Im in love with this property. The view was incredible. Having the rec center right across the street for my teenagers was very helpful. Falling asleep and waking up to the sound of the waves crashing on the shore was just what i needed to unwind It was clean and had all the amenities we needed. We will definitely be back. Prompt confirmation of our reservation. Easy to follow check in instructions. Loved the keypad to enter our unit. Did not encounter any issues during our stay. Pelican Watch 702 is an updated beachfront condo. Loved the view, cleanliness of the unit, decorating and the well stocked updated kitchen. We had family and friends in the area and they all commented on the layout and comfort of the unit. The redone wet bar area was well stocked with wine glasses and margerita glasses as well! Master bath was updated with a very nice tiled shower that was well lit. The 2nd bathroom was updated as well with new sink vanity, tile, toilet and paint. Really the only thing left to update in that bathroom was the original tub/shower but it,like everything else was very clean. Comfy seating in the living room area as well. Loved the sound of the ocean waves. Quick elevators in the building as well as luggage carts to get your things quickly to the unit. The only 2 suggestions we have are - perhaps change out the master bed mattress, it felt fairly hard to us but perhaps we are used to our pillow top at home. Did like that it was a king size bed. Add some more balcony seating, its lovely out there but at the present time there are only 2 chairs and a small side table. We would definitely come back to Pelican Watch 702 again!! The whole reservation system and communication was very easy and efficient. Tons of room and was surprised there were things like paper towels and dish washing detergent etc. I have used A1 3-4 times now at my stays in Kure Beach, they are all very efficient and helpful if needed. I Always use A1! This property was fabulous! I always stay at Ocean Dunes, LOVE IT! This unit as all of them was clean and exactly what I needed. I especially liked having the elevator to use this time. David quickly responded to questions. Very helpful. Very pleasant and helpful and just very nice to talk to! EVERYTHING!!! This house fit our families perfectly and had everythibg we could have possibly wanted or needed there!! All communication done online. Great info. Location. Modern conveniences. Well equipped. Dave and Chelsea were both great at responding to our inquiries! This property was as we expected and more! Very roomy, fully equipped kitchen, and lots of games for the cloudy days and evenings. We loved everything about it!